While the previous post put the California in context, this one is the “feel” post. 300 miles on the first day gave me a feel for the bike. What I liked, didn’t like, etc. Getting to ride through some diverse commuter roads gave me an impression of what the bike would be like when sitting on it day-to-day. I picked the bike up and gingerly rode off. I was thinking that it would be a much heavier bike than I’m used to, but after a few miles I was surprised by the nimble feel. It was nowhere near as light and “zippy” as the Breva 1200, but it moved nicely and the not-too-fat tires had superb turn in. I knew that I would have to tweak the suspension a bit, but not nearly so much as the Breva. Funny, it has almost as many adjustments, more than my Ducati even. 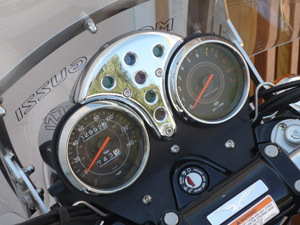 The steering shock is also a nice addition, as the windscreen requires it. I had never heard of full floating floorboards before, and I like them. I was able to move my feet in different positions while cruising long distance. The big jugs on the Vintage don’t prevent highway pegs, although I found a spot where I could hang my heels very comfortably without them. The little peg used as a pivot for your brake lever is a very smart idea. Other complaints from journalists were that you couldn’t get a toe under the front shifter to downshift. This was evident on this bike, as I’m sure that most of the west coast journalists rode this one. A 10mm wrench later at the first gas stop had this problem fixed. There are two adjusting rods for shift, just like my old Eldorado. The one connected to the shifter’s layshaft had never been adjusted, and I cranked it down as it is easily accessible from the side of the bike. Eyeballing it, I left it alone after the rocker showed level. Success — fat toes upshift — I prefer my heel anyway. Effortless. The big-pulled back bars take some getting used to, especially after the Breva’s motard-y rack. Once underway, the big 1100 pulls like a rhino, even from beneath 2000 rpm. Gearchange is “guzzi effortless”, which means that you “press and hold” each gear until you release the clutch. If you want something a little quicker, get the 6-speed on the Breva Sport/Griso/Norge, as it is much more refined. The five-speed on the Guzzi, slow as it is, is fantastically spaced to ride on the street with. First gear is completely useable, and I found myself cruising the streets of Santa Barbara in first between lights, only shifting when I had some yardage between me and the next stop. The first-second combination allows for easy maneuvering and nice “zippy” moves on the streets. If you’re expecting the slouched-over, “lone, unloved and apathetic biker” riding position that many cruisers offer, you’re going to be disappointed. The best position on this bike is a standard straight up and down, nearly cop-like. It’s comfortable, gives you tons of visibility – you’re eye-to-eye with drivers in all but the tallest SUVs. Friends that see me on the road say that I look better on this bike than the others that I’ve ridden — time to have a chat with the wife and see if she likes white or black. The controls have a nice “retro” look, but they are most definitely modern. Italian bike owners will be familiar with this layout. The clutch is butter smooth, allows for a lot of feathering and never gives a hint of any wooden or binary grabbiness. The instruments all have a slightly retro character, and this is also attractive, down to the speedometer that reads about 10% optimistic. Looks like Guzzi had some left over parts from my old one, as they read almost identically. Brakes took a little getting used to. I’m more of a “front braker” person, so I usually apply the fronts and then ease the back brake in for a settling effect. Turns out that the Guzzi Linked brakes work well for this, although I adjusted my technique slightly to just use the front brake lever to peel off speed, and the rear lever to get down to business. For those of you unfamiliar, the linked brakes on equipped Moto Guzzi bikes operate the left front disc in conjunction with the rear disc. The front brake lever operates only the front right Brembo. The combination is both effective and safe. Hard to high-side a bike with linked brakes when used correctly, since you can modulate the speed of both wheels with the rear lever. The Cal’s narrower than current vogue tires allow for the bike to turn in beautifully. I had to adjust the steering shock for high speed turns, as it tends to have an uncomfortable wobbling frequency around an indicated 80-90 in the big sweepers without it. Once dialed in it all disappears. The adjustments of the suspension are also welcome, giving me a very comfortable ride with dynamic handling capabilities. Lightness, if a word like that can be used with a cruiser, is apparent. The bike weighs in at only 560-ish pounds, and this translates into the “flick-ability” of this Guzzi when compared to it’s rivals, and also accentuates the already-high-standard Brembos abilities. The 1100cc engine is matched nicely to this bike — no more engine needed because you’re traveling smart and light, not loaded up with needless accessories, googaws and an extra 700cc or more to pull it around. 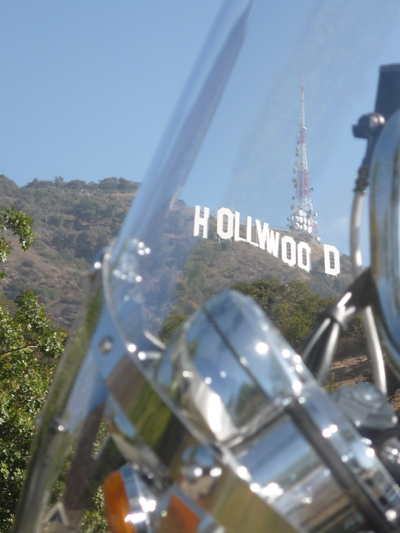 The first few miles northbound on the 405 from picking up the bike revealed a nice easy cruise in moderate traffic. As I neared LAX, the traffic backed up and the commuter lane ended, giving me the choice of splitting lanes or sitting. Like most California riders, I chose the former, but with caution as I was adjusting to the big Guzzi’s systems and controls. I have to thank Clint Eastwood and others for putting the look of the Guzzi into people’s minds. My black jacket, white Shoei helmet and the windscreen/light combo parted traffic like Charlton Heston in a red bathrobe. My urban camouflage was highly successful. Even so, the bags on the Guzzi, big as they are, don’t protrude past the bars or floorboards (I think this is part of the philosophy of their engineers as exhibited by the Norge’s similar layout), and the upright stance gives you so much control over the bike that splitting lanes is not the thrill ride I had expected. Puppies and Kittens to that. The cavernous bags are a commuters’ delight. 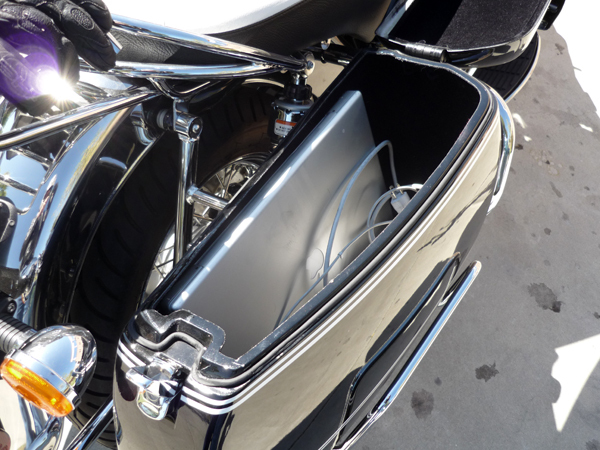 I was able to pack all my goodies in the side bags, and the real show-stopper was the ability to put my 17″ Mac Laptop in without having to take a running start. I could have easily fit five a side! We’re talking grocery bags in here. The bags come with an inner liner, they open very wide and of course have locks. I was advised to keep them locked down at all time to prevent accidental opening, didn’t try to find out what would happen if I didn’t. The only note about the bags would be to expect to paint the lids once in awhile as you’re going to hit them from time-to-time when mounting the bike. I don’t think this is a big deal if you ride it a lot, as stuff happens and that’s just part of riding. The Guzzi is so much fun to ride I don’t think any of them are going to be bought as hangar queens anyway. This is a real, he-man, ride-me-everyday kind of bike. I like the way I feel and look on it. I like being seen on it, but I wouldn’t ride it just to be seen on it. Does that make sense? Thank you for the great review! I’ve been looking to read a more detailed overview from an experience rider. As a result I am going for an 09′ model. Sorry, I notice I made a mistake with my email address. Previous Previous post: Moto Guzzi California Vintage Review – Day 1 – Can't get off the bike! Next Next post: Moto Guzzi California Vintage Day 3 — Cool vs. "Checkbook Cool"